UPDATE: Congratulations to Valerie! Our winner via Random.org. Thank you to those who entered. More giveaways coming up soon. Stay tuned! Organizing is probably one of the skills we all inevitably misplace once we become mothers and have little children. I've always been a neat freak and thoroughly organized when I was single but you get the picture. 7 years into my future, that gradually diminished! Fortunately, not totally vanished! Thanks to organizing products that helps keeps our home organized when we are not. 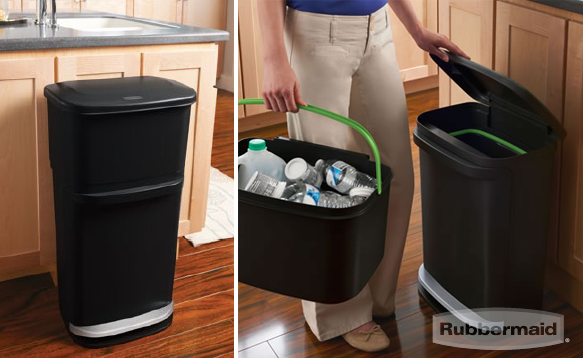 See how Rubbermaid 2-in-1 Recycler fare in this challenge! I found great advantages having the 2-in-1 recycler in my disposal (no pun intended). First off, my husband no longer piles and collects recyclable papers next to him on our dining table or on the seat next to him! WIN. Less clutter in the kitchen. That's not all. It eliminated unnecessary sorting and trip to the garage to dump the recyclables in the recycling bins. It made life easier to say the least! Or should I say, a little more uncluttered everyday. Check out my video presentation featuring more details of the 2-in-1 recycler! It uses 25% less floor space compared to typical trash receptacles. Made with recyclable materials and is recyclable. Both top and bottom bin have convenient handles. Win your very own 2-in-1 Recycler. Simply Subscribe to Zensible Mama RSS (must be activated) . And tell us what you think about the recycler. Deadline: Thursday, April 5, 2012 @ 12:00AM EST. You must leave your email address so I can notify you if you win. Winner will be announced no later than Sunday, April 8th. Random.org will be used to select winner. Open to US addresses only, 18 years and older. Winner will have 24 hours to response or another winner will be drawn. Sponsor will send the product to winner (Please allow 3-4 weeks for delivery). By entering this giveaway, you release ZensibleMama.com from any liability in case of lost, unreceived sponsored prizes. This would be very handy to help with our recycling. I love all the extra features this product has! I'm subscribed to your newsletter & I think this is a swell idea and I love the size and durability found in Rubbermaid products! I subscribe (tamarsweeps at gmail-dot.com). I like the recycler because I usually toss my recyclables out by the front door and it's in disarray and not very pretty. It would be great to have some organization. I've subscribed through google reader and I love that the recycler can hook up under my sink! I'm a RSS subscriber and this looks awesome. It's something I could even have my son do. I LOVE this recycler! This is SO much better than the plastic grocery bag that is hanging from the door knob of the kitchen door! Yes, that IS what I currently use for my recyclables and now you know why I REALLY want to win this! I already "like" your Facebook page (Dara Nix)! I love it! It is so easy to use and would be perfect in my kitchen. I subscribe on YouTube and liked your video Touchdown Florida. I love this- would save me so much room. Thanks!